Devastating earthquakes are an inevitable fact of life in the Himalaya, thanks to the powerful forces that created this awesome mountain range. For over 50 million years, the Indian continental plate ground up against southern Asia, and then finally slipped beneath it. 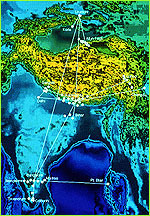 The resulting uplift of the Asian plate, plus the accumulation of material scraped off the Indian plate, is what created the Himalaya, including Mount Everest. This continental collision continues today, along with the threat of future quakes. But now scientists can predict the destructive power of future earthquakes through a combination of simple reasoning and high technology. GPS (Global Positioning System), is a navigation system using satellites that can pin down locations anywhere in the world to within a few meters. It has long been used by ships and planes to keep track of their whereabouts. Expedition member and renowned geophysicist Dr. Roger Bilham, is one of the early pioneers in the application of GPS to measuring the relative motion of large-scale features on our planet, like the Himalaya. In recent years, earthquakes in the Himalaya are testament to the fact that this warping process continues. In the past 100 years, four have occurred, and more are expected in the regions that have so far been spared. "To learn more about these devastating earthquakes, all exceeding Richter M=8," explains Roger, "we have installed networks of GPS points. These are brass or stainless steel pins glued or cemented into rocks whose positions are measured using satellite geodesy accurate to 3 mm. The relative motion of these points is telling us how the Himalaya is deforming." The result is clear: India is moving northward toward southern Tibet at 18 mm each year, and the high mountains are rising at about 5mm each year. An extensive lattice of 26 GPS survey points covers the Himalayan region. But to find out how the mountains are moving, researchers have had the arduous task of periodically climbing with a portable GPS receiver to each and every marker, in order to get new position readings from the satellites circling the earth. At any one time, a GPS receiver can pick up 8 satellites and store readings that determine its exact position at that given moment. The satellites are all on the same frequency and travel at thousands of miles an hour. GPS receivers are preprogrammed to receive a specific frequency. Hence, when the satellites move overhead the GPS receivers will unscramble the frequencies and be able to identify which satellite is passing by. Click here to hear more about how GPS works (RealAudio).